The consumption of yogurt plays a major role in the diet of the Middle Eastern people. Be it on the Eastern shores of the Mediterranean, in Northern Africa, or the Arabian Peninsula; be it for breakfast, lunch or dinner; the chances are yogurt is part of the meal. It may be served in its purist form simply ladled into a bowl; as a refreshing salad or a cool drink; cooked in a sauce or stew; or as the ubiquitous Labany (yogurt-cream-cheese) which is always anointed with the highly prized olive oils of the region. Growing up as a child, mother always made sure that she had a bit of yogurt saved to use as ‘starter’ for following batches. If for some odd reason she was left without, she would send one of us children to a neighbour to fetch some. The better the condition of the ‘starter’, the better is the resulting yogurt. The people of the region much prefer to make yogurt using goat milk, and this is especially true when the yogurt is to be cooked. No cook in their right mind would use cow’s milk for this purpose; it has to be goat-milk yogurt! This, for a good reason, for when cooked, cow-milk yogurt tends to become mealy (break-up somewhat); goat-milk yogurt remains silky smooth; in addition, it has a distinct flavor specifically sought after in certain dishes. As goat-milk yogurt is not readily available in the Western World, when cooking with cow-milk yogurt, one has to add a spoon-full of cornstarch or flour to it while it is still cold, and to continuously stir it until it reaches the boiling point. This helps keep it smooth and creamy. So, if you’re a heavy user of yogurt or if you want to try goat-milk yogurt, it may be worth your time to make your own. Follow the instructions and your yogurt will be a winner! Pour milk into a heavy pot. Place on medium or medium high heat. Bring to the boil, being very careful as the milk may overflow at this stage and cause a big mess on the stove. (It is essential that the milk reach the boiling point because the aim is to eliminate all of the existing bacteria in it, thus creating the required medium for the bacteria introduced in the culture later on, to flourish.) Remove from heat and cool to 40-50C (115-125F). If you do not own a cooking thermometer then follow the instructions in the next paragraph. Cool the milk for a couple of hours. Dip a clean finger in the milk and count from one to nine, not too slowly and not too fast. If the milk is still too hot and you can’t reach the number nine because it is too painful to your finger then the milk has to cool some more. Come back in 15 minutes and try again. If you can keep your finger in the milk to the count of nine and still feel comfortable for numbers ten and eleven, the milk is ready for the second step. Add 60 mL (1/4 cup) of the warm milk to the yogurt and stir, then pour the yogurt over the milk and combine thoroughly. Cover with a lid, and place the container on a thick folded blanket. Bring the corners of the blanket up to cover the pot completely. Place in a warm draft-free place and set aside for 12 hours. (Or you may do the following: warm up oven at 200C (400F) for 3-4 minutes. Switch off heat. Switch on the light bulb inside the oven. Place pot, without the blanket, inside the oven. Leave for 12 hours.) Uncover. Cool for 4 to 6 hours. Stir and spoon into glass or plastic containers. Cover and refrigerate. If you wish yogurt to acquire a lemony tang, leave unrefrigerated for 24 hours. Laban will keep for 2 to 3 weeks in refrigerator. Remove pinkish spots, if they form on surface of yogurt with a spoon, and discard. A note of caution: If you let the milk cool down too much, the yogurt will not form, or it will be too thin. If the milk is too hot when you add the culture, you will find a thick layer of water on top of the yogurt when you uncover it. Some of the homemade yogurt may be used as starter for the next batch. This method streamlines the whole process. You use one container from beginning to end. No pots to wash; no blankets to fold. Microwave milk until the boiling point; it will form a bubble on top. (It is essential that the milk reach the boiling point because the aim is to eliminate all of the existing bacteria.) Take out and leave to cool until 40-50C (115-125F) or do the count until nine finger test explained above. 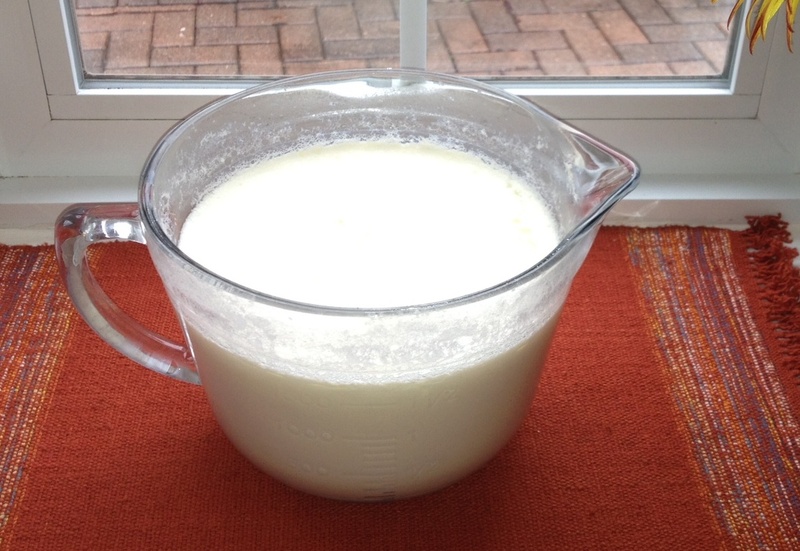 Add 60 mL (1/4 cup) of the milk to the yogurt and stir, then pour the yogurt over the milk and combine thoroughly. Cover, place in the microwave for incubation (to contain the heat), close the door of the microwave and leave for 6 -7 hours or overnight, without disturbing it! If for some reason the milk was disturbed, and does not set, simply microwave for 1 minute and leave as is (in the microwave) for another 4-5 hours. This should do it.